CHINA is the origin for many things Japanese, but perhaps the most peculiar is the kida. That’s the main attraction of the Myokensai festival every year in Yatsushiro, Kumamoto, held by the Yatsushiro Shinto shrine. 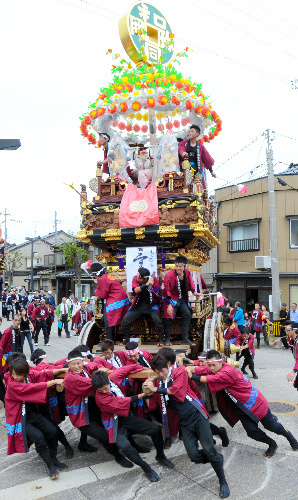 The mythical creature is said to have hitched a ride to Kumamoto on the back of a Chinese divinity. 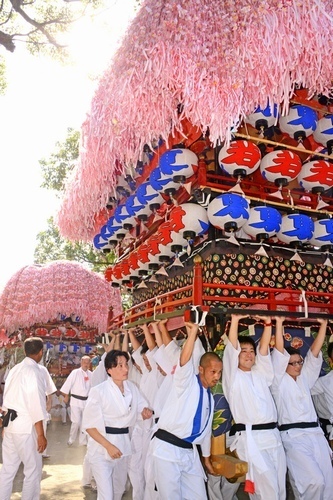 Myokensai literally means “strange sight festival” and the name is a perfect fit. That’s because the kida is a part turtle and part snake. The head and neck is a serpentine one meter long, while the creature with its turtle body is four meters long in all. It’s the main attraction in a parade of nine floats and 1,500 people. Reports say shouts go up from the crowd when the kida, manipulated by five men, emerges on the banks of the Mizuna River. 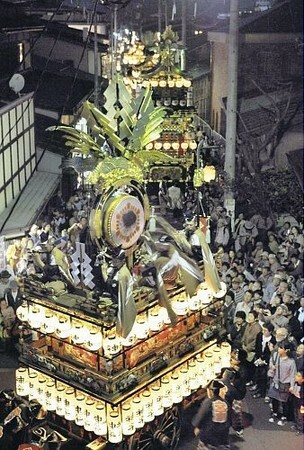 It’s so popular that the Yatsushiroans made a special kids kida that joined the parade for the first time in 2009. Or maybe kidas reproduce by parthenogenesis. And speaking of strange sights, the Mizuna River is actually a subterranean river that usually has no water above ground. It fills with visible water after a heavy rain. The name for the river is another perfect fit — it’s written with the characters for “no water”. Who knows? Maybe the habitat of the turtle snake is the unseen waters of the Mizuna River. It shows up on the street at the end of this short video. THERE’S no better place in the world to take a bath in Japan, whether it’s at home, a small public bath in the neighborhood, a large public facility with extra features (such as massages and meals), or a hot spring resort. The Japanese understand better than anyone that they’ve been blessed with hot water, and that’s one of the reasons for the annual festival held at the Shiobara hot springs in Shiobara-machi, Tochigi. The Shimobarans themselves don’t know how long they’ve been taking the waters, but it was already well before 1659, when the supply was abruptly cut off by a tsunami. The folks in the neighborhood were so concerned they offered a prayer at a local shrine. Lo and behold, the water was restored. Hallelujah! Grateful for their good fortune, they held a ceremony to distribute the sacred water to other shrines nearby. Every year since then, they recreate that ceremony to give thanks for the spa waters and to pray for the prosperity of the resorts. 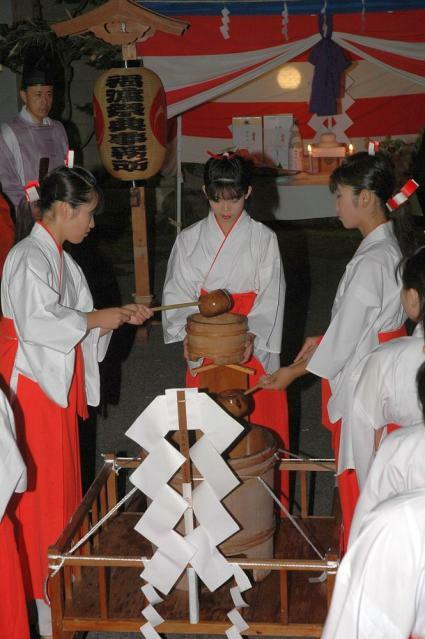 It starts with a special Shinto rite for scooping out and dividing the water. 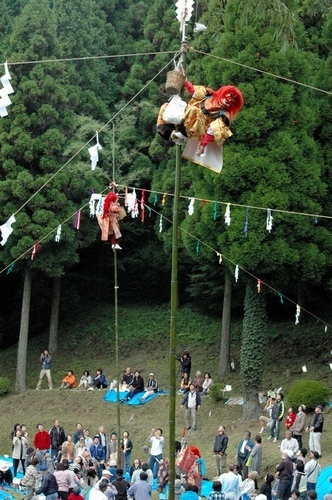 That’s performed by five miko, or shrine maidens, who are second-year junior high school students. The water is then taken in a procession of 100 people dressed in white robes to the Shiobara Hachiman Shinto shrine, and then to other shrines and ryokan in the area. It all concludes with a performance of the Urayasu dance by third-year junior high school students. Well, it really concludes with a hot bath followed by a cooling beverage, but you know what I mean. Here’s what the Urayasu dance looks like when performed in another location. 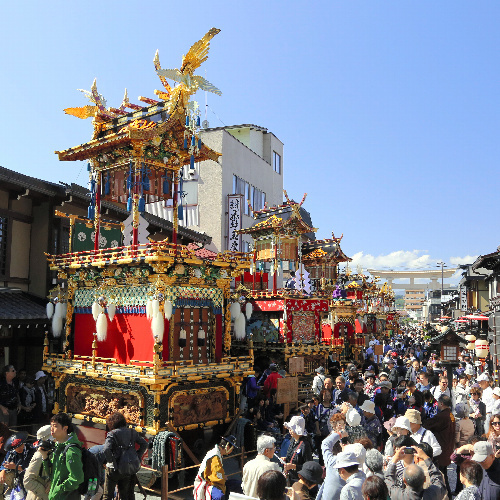 The Onda Hachiman-gu (Shinto shrine) fall festival in Muroto, Kochi. Every other year the four floats are decorated with paper flowers, and this was a paper flower year. They are paraded through town during the day, and festooned with lanterns for some night-time twirling. 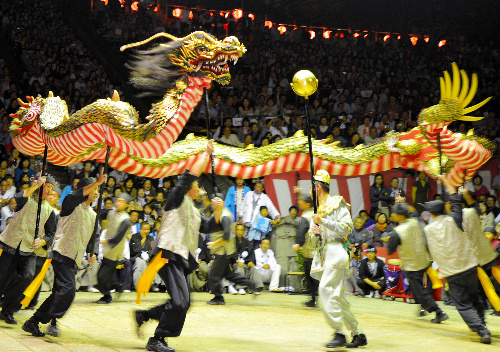 The Nagasaki Kunchi, an important intangible cultural treasure of the nation, conducted by the Suwa Shinto shrine in Nagasaki City. They have a larger stage for more performances once every seven years, and this year was a big stage year. Practice for the fall event starts in June. The Chinese elements are distinctive of Nagasaki. 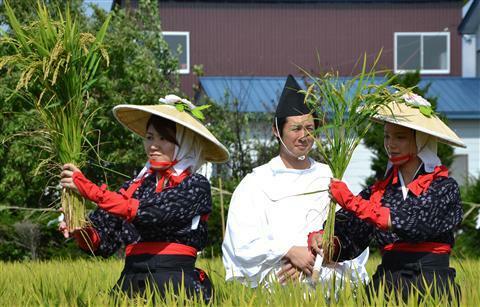 The nukihosai, a Shinto rice-cutting ceremony at a sacred paddy in Sapporo. 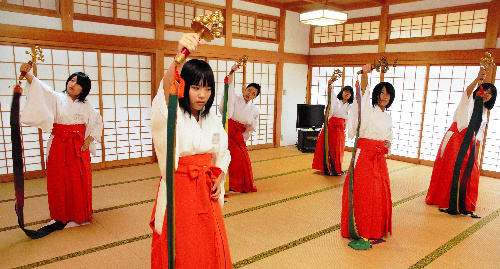 Miko shrine maidens practicing a Shinto dance at the Kumanonachi shrine in Wakayama. 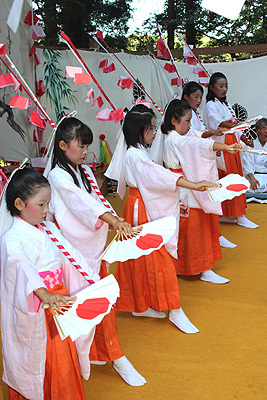 Primary school girls perform the flower dance at the Hassaku Festival in Minamiboso, Chiba. The Shirakawa Chochin Matsuri last month at the Kashima Shinto shrine in Shirakawa, Fukushima. 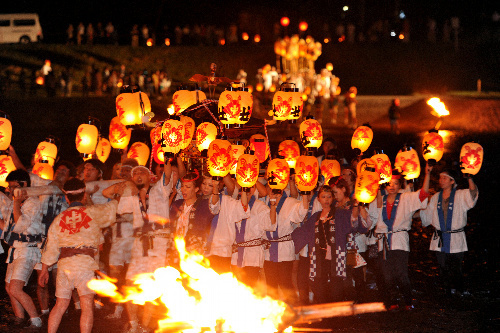 One of the three largest lantern festivals in Japan, it is more than 350 years old and held every other year. 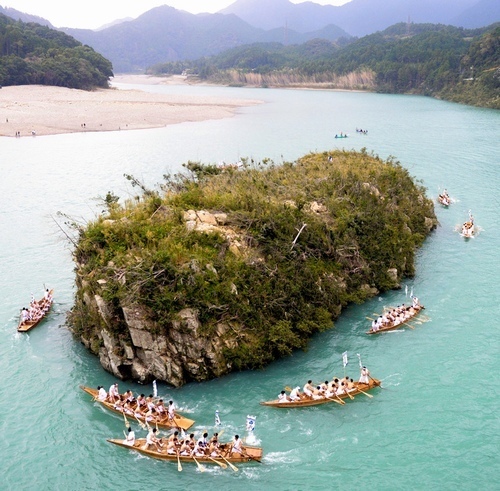 It was supposed to have been held last year, but was postponed due to the effects of the Tohoku disaster in March. 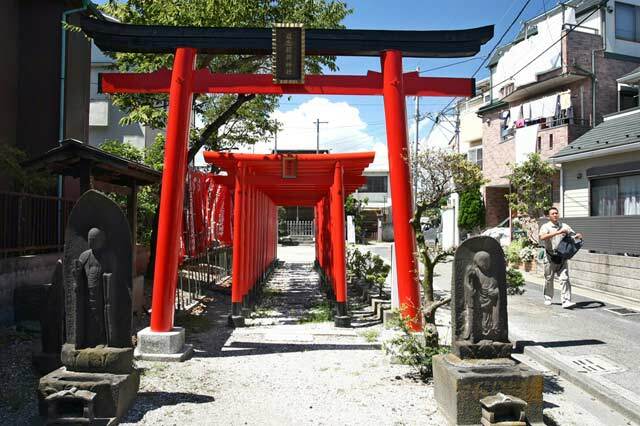 Torii at the Donen Inari Shinto Shrine in the Namamugi district of Yokohama. The Namamugi Incident occurred near here in 1862.